The Coalition Avenir Québec, which won a majority in last week's provincial election, is promising to introduce a law prohibiting civil servants — including judges, police officers, prosecutors and teachers — from wearing religious symbols in the workplace. Legault has yet to be sworn in as premier. 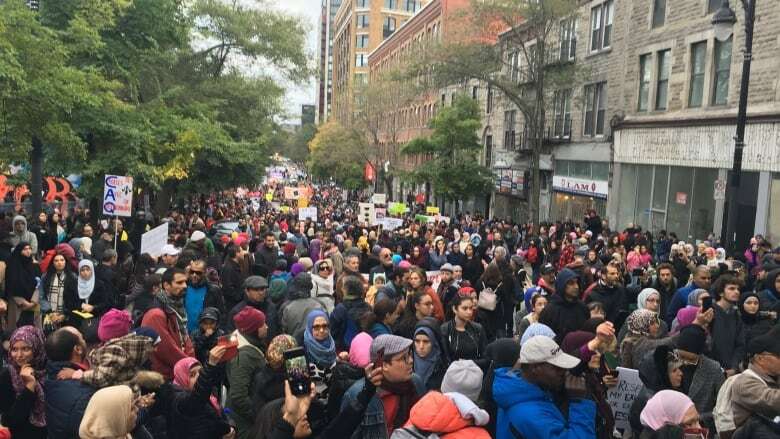 A Thanksgiving weekend protest in downtown Montreal drew thousands to the streets on Sunday, with demonstrators denouncing racism and a law being proposed by Quebec's incoming premier, the Coalition Avenir Québec's François Legault. 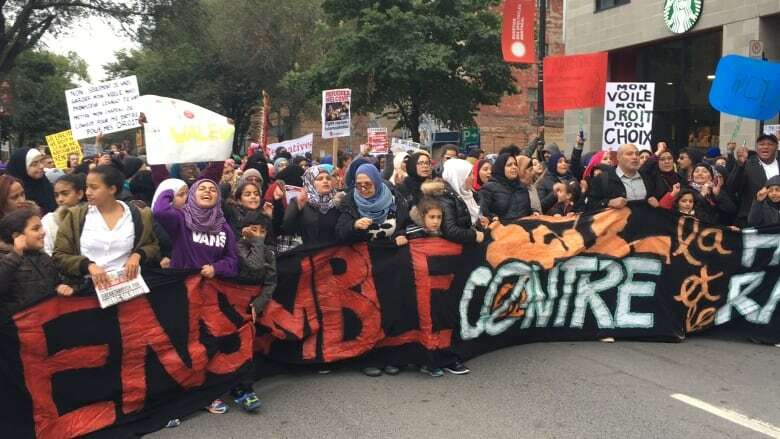 Protesters chanted, "Legault has got to go" and "François, Quebec belongs to me" as they marched from Place Émilie-Gamelin​ along René-Lévesque Boulevard. The CAQ, which won a majority in last week's provincial election, is promising to introduce a law prohibiting civil servants — including judges, police officers, prosecutors and teachers — from wearing religious symbols in the workplace. Legault has yet to be sworn in as premier. A representative for the CAQ government said Wednesday that those who don't comply with the coming law could be re-assigned or lose their employment altogether. People filmed the march on their phones and protesters lit a smoke bomb on René-Lévesque Boulevard that sent red smoke into the air. Upbeat music played and protesters carried a large banner that said: "Together against hate and racism." Many of the protest attendees donned religious symbols. Nadjah Oumid was one of them. 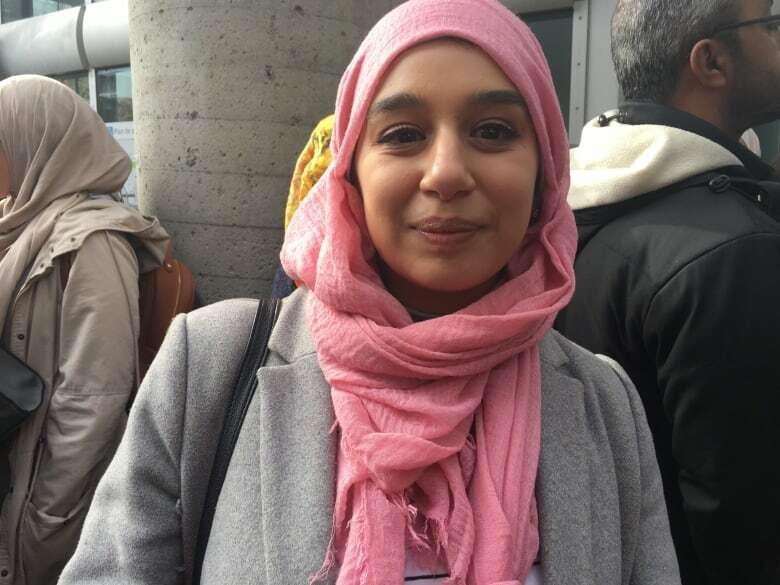 "The hijab, for me, is like a part of me," Oumid said. "I think the government shouldn't oppress people for what they want to wear." She said she thinks it's sad that people wouldn't be able to access certain jobs because they wear a hijab. Another protester, Sonia Haddad, says she wanted to take a stand against racism for her children. "We're part Arabic, part Quebecois… so I think all of us together, we have to really be in solidarity," Haddad said. "I'm very scared of what's happening in politics right now in Quebec," she said.